Welcome to our final week of our Artbooking in August blog hop! If you came here from Terry's Blog you are on the right track. This hop is a cricular hop so if you go all the way through you will come back here but if you get lost along the way, you can visit Adeline's blog HERE. She was our fantastic and fearless organizer for this four week hop and I'm giving her a big round of applause for all her hard work! Over the past few weeks I've done a whole lot of projects while playing around with my new Cricut Artbooking Cartridge. I love how the three Close to my Heart cartridges work together to give you 2,100 different images that you can combine, resize and re-shape (using CCR) to give you limitless possibilities to create. Sometimes though, you just want a quick and easy project. The kind you don't have to think about but just pop some paper through and have your project done in a flash. When you need that kind of thing, Artbooking has you covered! I turned to pages 86 of the Artbooking handbook and followed the recipe there to create the layout shown. I made one change to the layout by switching out the numbers for the word celebrate from the coordinating layout on page 87. Other than that, the most difficult decision was what colors of paper to cut each element from. These fast and easy layouts are great for STASH BUSTING because they are perfect for digging around in your embellishments and finding just a few pieces to color coordinate with your layouts and tie them all together. I used some long ago retired badges and yellow buttons for embellishment and a bit of white gel pen to define the star overlay. 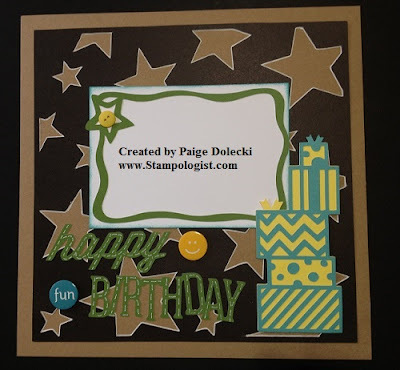 Now, hop on over to Pam's blog and see what she created for us this week! If you'd like to do some stash busting of your own, visit my shopping site at www.Paige.CTMH.com and pick up your Artbooking Cartridge today! If you haven't picked up your FREE August Stamp of the Month with a $50 purchase yet, time is running out for the limited edition A Chocolate Affair set which is too cute to miss! Thanks for joining us in our month long Artbooking in August blog hop! If you had fun visiting me, follow my blog by e-mail in the upper right corner or stay on top of my happenings by following on facebook. Stay crafty my friends! This layout is terrific! And I love the concept of stash-busting! We all have way too much 'stuff'!! Thank you for all of your help in planning this blog hop - your themed suggestion really made it all come together!! Paige, you are so right that this cartridge is perfect for stash busting! This mini album alone that I'm still working on, has seen me using up lots of older papers. I will admit that I'm still hoarding some (most notably the Veranda and Hooligan's paper). Each of my beloved paper packs reminds me of why I got involved with Close To My Heart in the first place. Thanks for being part of a great hop! What a fun layout! Stash-busting here I come! Love this layout! Hope you don't mind if I scraplift...credit given to you of course. Great job! I have been having fun stash busting myself. What a beautiful layout!